Get a free snack size wings boneless or traditional @ Buffalo Wild Wings. 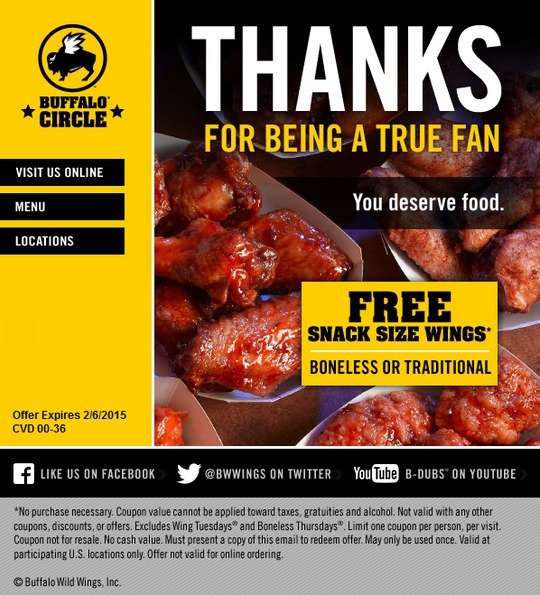 Click the link to go sign up for their news letter Buffalo Circle® members receive: The Buffalo Wild Wings® email newsletter, Buffalo Circle®, is the ultimate source for all things Wings. Beer. Sports™. Get exclusive information first on what’s happening at B-Dubs®. Click the link below then print the coupon present it at your nearest location to redeem it for free snack size wings.